There are any number of obvious clues that we are approaching Christmas aren’t there? The nights draw in, the seasonal blockbuster ads hit our TV screens and Mariah Carey is warbling away incessantly on the radio. All sure signs indeed, that… ‘holidays are coming’. But talking of that particular festive advertising jingle, in Morpeth where I live, we’ve just experienced a more recent and as far as I’m concerned, far less welcome sign that festivities are underway. Basically, the entire high street was blocked off for two whole days, the local taxi-rank had to be completely relocated, and a park & ride service put in place. All to facilitate the visit of… well, nothing more than a lorry, really. To my absolute astonishment, Rachel - my wife, could barely contain her excitement. “Don’t forget I’ll be home a bit later tomorrow Mark. Jackie and I are going to see the Coca Cola truck”. She’d said the night before. “Yes. So, it’s a lorry, but with Coca Cola written on it”. “They light it all up. It’s lovely apparently. And they’re having carol singers and stuff. It’ll be nice”. “All that, for a bloody lorry?”. “Oh Mark, you’re such a bah humbug”! On this specific matter she may very well be right. But I just don’t get it. Although I rarely imbibe of the sugary beverage, I was never particularly offended by the juggernaut in their rather delightful animated TV commercial some years ago. But does that mean that I harbour a peculiar urge to spend nearly two hours queueing up in the freezing cold, to have a selfie taken with it? Er… no. Like I said, I don’t get it and I completely accept that it’s possible I may be in the minority. But I just wonder where it all might end? Who’ll be the next conglomerate to commandeer Christmas? Might our local chamber of commerce seriously consider putting us through all the inconvenience and traffic disruption again, so we could welcome the Wetherspoons delivery wagon? Or maybe a Peter’s Pies van? 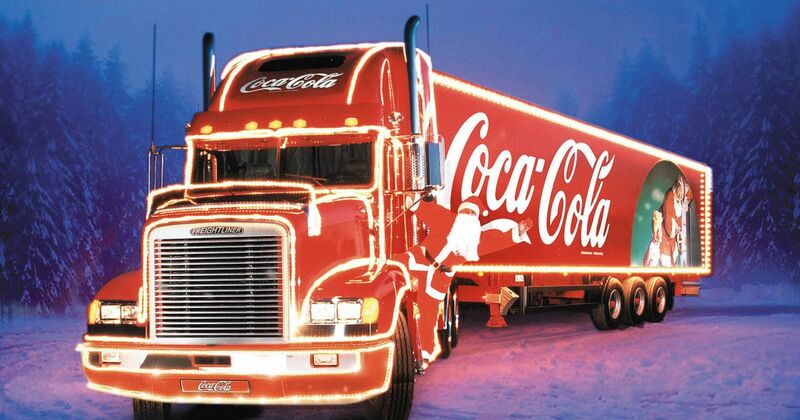 Yes, they can dress it up in as much tinsel as they want, but at the end of the day… the Coca Cola Truck is just a bloody lorry!